I need help! Not the sort of help where you should be worried about me or anything. What I need assistance with is the result of an awesome new project I would like to unleash. I'm looking for someone to join the WW tribe to help me produce even more great work! I'm seeking an experienced and talented artist who can skillfully do BOTH hair and makeup for my photo shoots based in Boone, NC. This opportunity would be best suited for a hair and makeup professional looking for a freelance position. New graduates and up-and-coming artists looking to build their portfolio will also be considered if you can provide references and/or images from previous jobs. Must be capable of doing BOTH hair and makeup in a timely manner. Take direction in the form of descriptions and/or tear sheets to create a variety of looks and styles for models of all types. Maintain a positive, welcoming environment for clients and others involved in the shoot(s). 2+ years of proven experience doing hair and makeup. New graduates and up-and-coming artists looking for experience will also be considered if you can provide references and/or images from previous work. If you or someone you know is looking for an opportunity to work with a talented and creative Boone, NC photographer, I would love for you to consider joining the WW Tribe! I specialize in wedding, engagement and lifestyle photography for free-spirited couples, families, individuals and business owners. If you'd like to learn more about me, I invite you to visit my official website www.wayfaringwanderer.com. 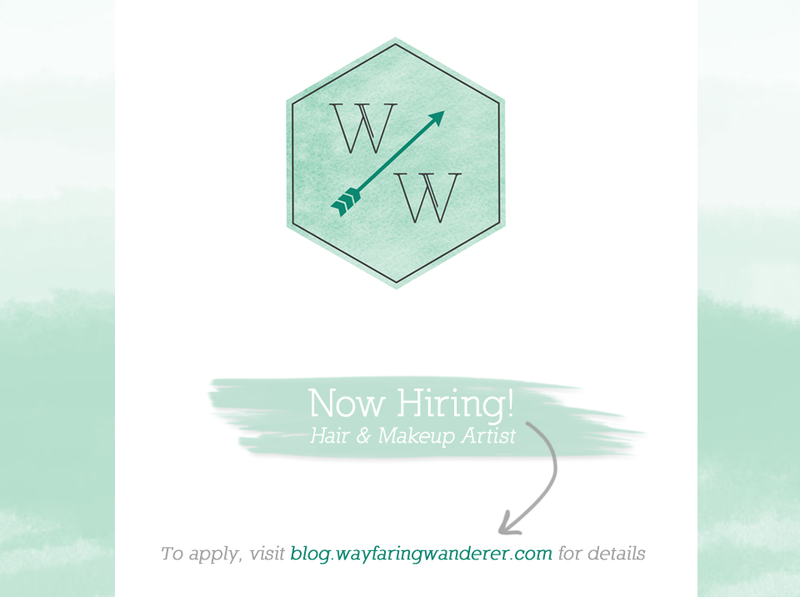 To apply, please email your resume and/or a link to your online portfolio to wayfaringwanderer[at]gmail[dot]com along with a brief (one-paragraph) description as to why you should be considered for this position. The subject line of your email should read, “Hair & Makeup Artist Application.” Please, no phone calls! The deadline for applications is Feb. 1st, 2014.